I like having friends with good taste. It sure makes my shopping sprees easier! Earlier this week, I paid Alston's a little visit. 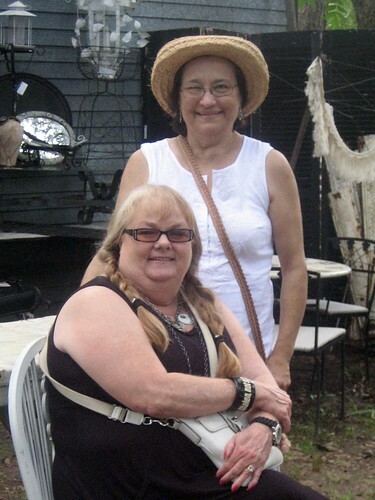 My friends, Richard and Jo Ann, had a bunch of shoppers when I was there. As well, they should! The shop and yards are stocked with great stuff! 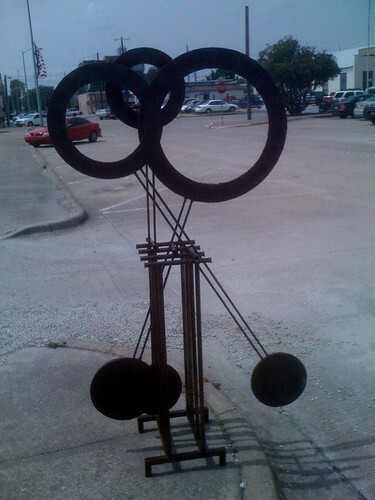 I talked Richard out of this wonderful wind sculpture. Thanks, Richard! The wind helps it move back and forth. Way wonderful, isn't it? This morning, I drove into town to see the Debriz show. I do love a garden show! Here are Debbie and Fran, mugging between sales. I did take a few pictures. Let me tell ya, I know a lot was gone. And I know a lot was sold. I saw "sold" tags everywhere! Happy for them. Sad for me. Oh, I said something about pictures, didn't I? Click here for the album, and don't forget the slideshow is a good way to view. You want to see what I bought from these friends with good taste? 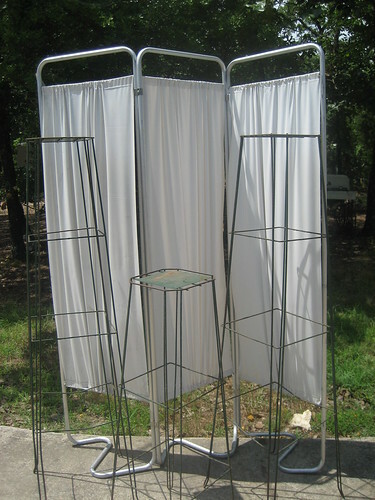 I got this hospital screen and these plant stands. And this. Ahhh. This. 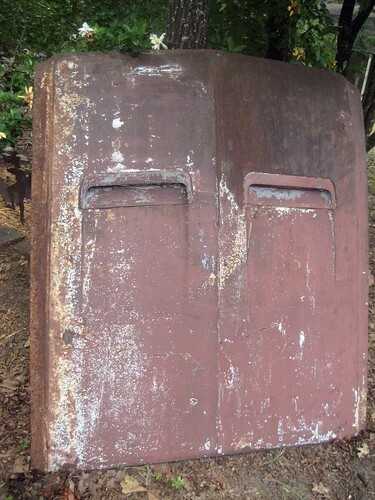 It's an old car hood with vents. Maybe someone would like to show off their good taste and tell me what automobile and year model this came off? Do you like it? Although the Debriz show has ended, you can still enjoy shopping with Cat Daddy & Debbie and with Liz & Fran, at Winnie & Tulula's. Their good taste is all over inside that store! Sweet, huh? Wouldn't you agree that my friends have good taste? You know Robelyn with red.neck Chic? She has enough good taste to keep me in handbags for the rest of my live long days. 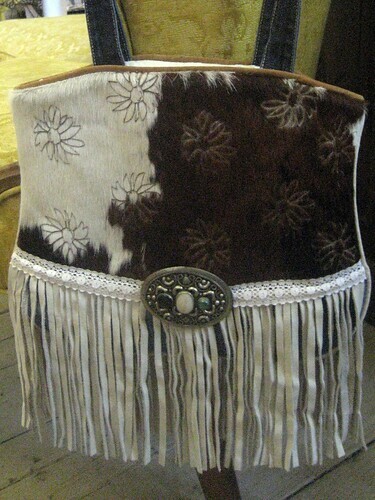 This hair-on with fringe had me giggling the moment I laid eyes on this bag! Check out that belt buckle. 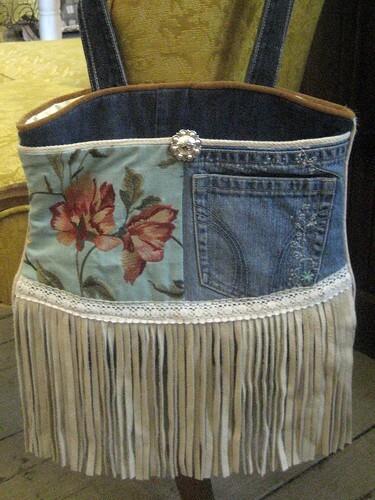 And then, there is this side with the denim and beautiful blue fabric. Dang, the girl has skills and good taste! Robelyn has an etsy shop. She sells in Hillsboro, and she has a line of purses that I carry in my store in Poetry. Between Richard in Garland, Debbie & Cat Daddy and Liz & Fran in Athens, and Robelyn in Hillsboro and in Poetry, what are you waiting for? Fire up your gps and make plans to visit my friends with good taste this weekend! And take pictures! I want to see what you get. Yep! They all have good taste and so do you girl! I love that purse that Robelyn made for you...she's good! Love your wind sculpture! Love the goodies you got! Love the purse! Love the pictures of the big event! Oh, my, this is a love fest! You know...other people have riches in money...I prefer my riches...good friends like you. Thanks! You HAVE to take me to see Richard!!! I wanna see, I wanna see!!! 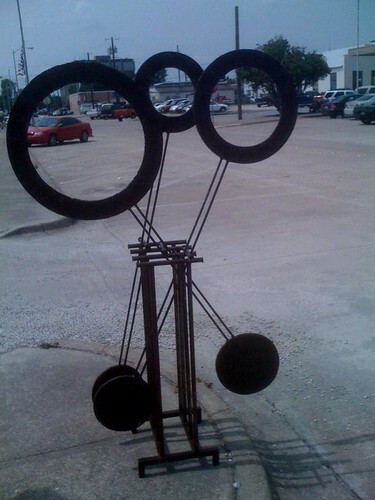 I LOVE the sculpture.... are you going to be caught in your front yard at odd times watchin' it go?! Love the Debster, Liz and Fran - I WISH I had made it... I would have leg wrestled you for the hood!!! So... what kind of car/truck is it off of?